The August release blog went missing in action…Oops! This one covers all the releases of the last two months (so August and September). Over the past two months there have been four releases of Kopano WebApp that introduced many new features (too many to mention them all). Filtering data (getting an overview) got a big upgrade with the ’show only unread‘ option for all mail folders – a frequently requested feature. 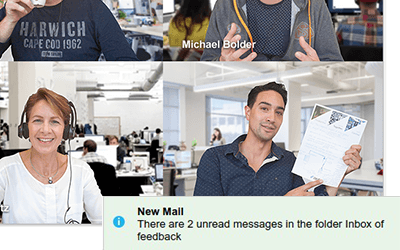 Notifications for new items in shared mailboxes has been implemented too – a (server sided) configurable interval can help prevent high load on the mailserver when polling many mailboxes. Since version 3.4.22, WebApp can support direct opening of an uploaded EML file – this can be used to open an ‚offline email‘, the .eml files directly from another application that uses WebApp. The next version of DeskApp will use this feature to implement exactly that. Administrators get tools that allow for more fine-grained control in application access – through the use of KopanoEnableFeatures flags access to WebApp and/or DeskApp can be restricted if desired. Be sure to update to the latest Active Directory Services add-in so you can select the correct values. Debugging on a per-user basis can now also be enabled if you’re looking for that elusive bug one specific user reports from time to time – resulting in a single log file with all the errors that happened for that particular user, helping with support and development cases. Of course there have been plenty of bugfixes too – have a look at the changelog if you want to know about them all. All in all we’re getting closer to a release of WebApp 3.5, which will have a great set of new features that help streamline your days – grouping, filtering and importing/exporting of data. The releases of the Kopano Groupware Core 8.6.x series have primarily focused on stability and introduced improved small improvements to the tools we use every day as an administrator. The scripts that handle automatic updating of meeting requests (add them to a calendar as tentative, or update the tracking) have received a fix where in some cases categories would be removed. Creation of user stores has been improved too, and kopano-backup tracks ‚deletes and moves‘ of objects in a mailbox too while backing up and restoring. There have also been some bug fixes – have a quick glance at the changelog for a detailed list. Kopano Groupware Core 8.7 is coming up not too long from now – introducing the foundation for some great development steps that are already in progress, such as the new Kopano Meet (more about that later). If you already want to play around with new things such as Konnect, the REST API, and perhaps help us test Kopano Meet, give the 8.7.0 version a test drive in your lab environment. Or join the Kopano Meet test group if you have the time: https://forum.kopano.io/topic/1795/looking-for-testers-for-new-web-meetings-implementation. Aside from some bug fixes, the release of Kopano Files 2.1.4 sorts out a nuisance for some of our customers and partners where the folder list would not be sorted alphabetically. This is now the case per default. The 2.0 version of the Kopano Outlook Extension is available. Based on experience and feedback of our customers we have made some change to how the Kopano Outlook Extension behaves – especially related to features with high performance impact such as opening shared folders or synchronising a large mailstore. Through the use of new Z-Push features the KOE can now suggest a reduced offline synchronisation window for large mailboxes that are opened (shared ones, as well as your own). When the size of the mailbox you are trying to open gives reason to suspect potential performance issues, you will be offered to reduce to a smaller timeframe – less than ‚everything‘ but more than ‚one month‘. A maximum amount of shared folders will be introduced in KOE 2.0 – currently limited to 50. These individual shared folders / calendars get the same synchronisation window as your own store, which in many cases is both unwanted and the cause for many synchronisation issues with your own store. With KOE 2.0 you get the possibility to a shared mailbox as if it were a separate account – with its own synchronisation window and a separate local store. Of course we recommend that you use our primary clients Kopano WebApp and/or DeskApp, but in the cases working offline is essential you should get an improved experience with KOE 2.0. Have a look at the changelog for any known issues that have been reported by our customers and partners.